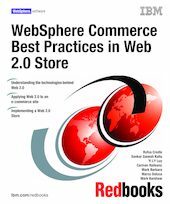 This IBM Redbooks publication positions Web 2.0 Store and demonstates how Web 2.0 is applied to an e-commerce site. This book discusses the Web 2.0 Store and Social solutions. In addition, you will gain an understanding of the contributions Dojo and Ajax apply to the Web 2.0 Starter Store. This book emphasizes some of the Web 2.0 Store solution’s benefits for the client and describes the Web 2.0 features of the new Web 2.0 Store solution of WebSphere Commerce. This book discusses the Model View Controller (MVC) design pattern for Web 2.0 and provide guidance to developers who are building and customizing Ajax-based applications. This book explains how to implement your own Web 2.0 Store using Ajax and Dojo and on the basis of the Madisons store. Developers can take advantage of building their own Web 2.0 Store in more efficient ways, for example, developers quickly design, develop, test, analyze, and deploy high-quality Web 2.0 Stores. This book describes the best practice when you test and debug the functionalities of your Web 2.0 Store, and also presents the Web 2.0 Store optimization best practice. This book is targeted for the following audience, WebSphere Commerce Developers, WebSphere Commerce Architects, and Technical Sales Specialist.